I have a sort of formula I use and teach for crafting scenes. It's general enough that what makes it onto the page isn’t predictable, but helps in prepping or revising the scene. My method is based on identifying the conflict in the scene. Recently in a class I’m teaching about Show, Don’t Tell, I said it’s much harder to write a “happy scene” than one with conflict. Then, of course, I challenged my students to do just that – write a happy scene and focus on using show, don’t tell. I believe readers read for conflict. For the movement of a character through a challenge as he tries to reach his goals. So what place do happy scenes have in the novel? They can be great for pacing, for a breather for the reader. They can set the stage, or up the ante for what’s to come, too. In completing my assignment, one of my students was challenged with writing the happy scene. Her book has a character who’s weeks away from getting married to Mr. Perfect. He’s the guy she’s dreamed of, but in the story, Mr. Ex steps back into the picture. Her happy scene comes at the beginning of the character’s journey through the story. She and her fiancé are perfectly happy and content as the days tick by toward the wedding. So how to write this? How to show the stasis of the character before the journey presents itself? Before I answer that specific question for her book, let me illustrate some of the "Rules of Happy Writing" for your novels. First and foremost, when you’re faced with a happy scene, ask yourself if it’s really necessary to the story or are you avoiding conflict on your character’s behalf? So many of my students struggle with this issue. Most are female, most were raised to be “nice.” Dragging characters you love through the mud of a real journey can be hard. 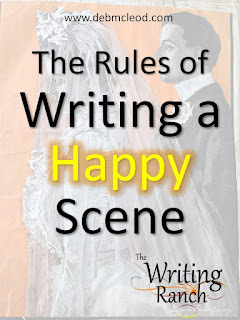 So if you’re writing a happy scene, know whether it really serves the story or if it's simply the author avoiding conflict on the character's behalf. I had a great teacher who occasionally would comment on my pages with “you haven’t earned this yet.” Usually her comment circled a passage that was intended to pluck the heartstrings of the reader. Usually the passage bordered on purple prose. It was the satisfaction that should come after a hard-earned battle for my character. But if I hadn’t put my character through the paces enough with the reader, I hadn’t earned the right to sentimentality. You can get away with a bit of purple. You can twang the heartstrings, but you have to earn it. When you haven’t earned it yet, it’s usually because you, the author, are feeling it, but you haven’t gotten the reader to feel it. They’re not ready for the warm fuzzies. So how do you get them ready for it? Conflict. When you’ve given the reader enough conflict or enough action, you can create a happy scene or a paragraph of purple. By then you’ve earned it. The reader will appreciate the breather. Their hearts will overflow with joy right along with your character. But you have to set it up. But what if, as in my client’s story, the happy scene comes toward the beginning of the journey? What if that's the status quo you need to set up before your character launches into the story? There are ways you can structure this happy scene, e.g. frame it with two conflict scenes, make it flashback, and more. But I want to show you how to use happy to foreshadow unhappy. Once upon a time in college, a teacher challenged me to crawl inside a poem and write a creative nonfiction piece about it. It was an 18th century poem from the Romantic Period. I have no recollection of the title or who wrote it, but it was about a bride and her wedding. It was long and intricate, stanza after stanza of flowery language about a happy event. Gag me. It was a poem I would normally read only on the surface and move on. But this one had survived the ages, so there must be something to it, right? The Romantic Period was the time where the individual over society began to have a presence in literature. So when I read that poem closely, what I found was exactly like you find in “The Road Less Traveled” by Robert Frost, which everyone mistakes about being unique and different, when it’s really about crafting your perspective about the road you already took. This bride poem was about a bride in the days of arranged marriages. It showed her terror about being given to someone she didn’t know who would have absolute power over her for the rest of her life. All of it dressed up in the pomp and circumstance of a large and rich wedding. As I studied the language, I began to look behind what was on the surface: a bride chattering about her wedding day. But she used words like “scratchy” for the lace at her neck. She was describing the dress with all its layers and petticoats as heavy. The strain of walking gracefully, curtsying gracefully under all that covering. Her disappearance inside the icon of the bride as time was creating a relentless march toward the big event. There was tension in the poem I hadn’t noticed at all until I read it more carefully. The poem was about a frightened young girl who had disappeared into the mask of the "bride." When I read it closely, I could see that she was actually dreading what was about to happen within all the lovely excitement of preparing for her wedding. There was conflict between being the center of attention, but really being invisible as she took on the bride role. All the preparation was really a slight of hand to keep the bride from contemplating what’s happening to her; that the rest of her life as Mrs. X is unknown. So many bad things might be waiting on the horizon of an arranged wedding for political purposes. There were chinks in the picture you wouldn’t see if you simply took the poem and the character at face value. So how does this help my student when it’s just one scene and not the whole? With a poem the whole is right there on the page, to read in one sitting while a scene is a building block. And that’s the key right there for my student: recognizing that her happy scene is a building block to the future novel that will unfold for the reader. Take the premise of this story. A young woman is moving close to her wedding day with Mr. Perfect. When the Mr. Ex comes into the picture, he threatens to worm his way back into her heart. So I ask this: if the possibility for Mr. Ex to come back into her life exists at all, then we have to see those chinks in the perfection in the happy scene. Right? Because if it was perfect, Mr. Ex wouldn’t be able to get back in, would he? So the key to writing this happy scene is in the subtle clues that will show all is not really perfect in this world. It’s not yet conscious to the bride that Mr. Perfect isn’t what she wants. She thinks she does. But have you ever had a relationship with someone with whom you did not fight? Isn’t there something missing? When the surface is perfection, isn’t there something imperfect lurking below? There should be in this story, for sure. So how do you do that? The same way the poet did. Look at the verbs you’re using. Look at the modifiers that shape the nuance and the flavor of the scene. It’s off just a little. There’s foreshadowing in the language. Not foreshadowing a particular incident to come. You don’t want to do this heavy-handed (unless you do and then I say, go for it). But you want to add a shadow to the perfection. A too-bright smile. A tiny misunderstanding. Maybe both reach for the last strawberry in their perfect brunch and then almost fight to be polite and let the other one have it. Who wins? Does he insist and she picks it up and brings it to his lips in a sensual moment. He opens his mouth to bite while gazing into her eyes and a red drop drips onto the sleeve of her new ice-blue satin blouse. The spot which she notices and covers up a few times during the scene. The spot she’ll try to hide by turning the sleeve under her wrist, but that means the sleeve is now twisted and is slightly uncomfortable. If you pick a few of these things, a perspicacious reader will get it. Most readers won’t, but that’s OK. You will be creating a tad of unrest that all is not well. It won’t be conscious to those non-perspicacious readers, but when Mr. Ex steps into the picture, and she is thrown off balance, it will seem inevitable, because those clues have been planted. When she does let Mr. Ex back in, the reader will say, I knew it wasn’t all that perfect. Of course, they knew. Because you'd planted those seeds in your happy scene. About the Author: Deb McLeod, MFA, practices novel research immersion. For her novel, The Train to Pescara, Deb journeyed to Sardinia to study ancient goddess worship and spent time in the Abruzzi village her great-grandparents left in 1905. Her metaphysical knowledge for the Angel Thriller, The Julia Set, culminates from four years of studying and teaching meditation, clairvoyance and chakra healing. For over fifteen years, Deb McLeod has been a creative writing coach helping other writers to embrace their passion and get their words on the page. For more, see www.debmcleod.com. Wow, this is a brilliant post, Deb. Thanks! Great insight and advice. Layering in these subtle clues is a wonderfully fun challenge. It's one of my favorite aspects of writing. Hey Barbara, thanks! It's one of my favorite aspects too. Thanks so much for this, Deb. As you can see from my current blog, I love that fresh breath of air in my literature, and you have explained so well how to make it work. Great post Deb. Conflict scenes are hard to write but, in my book, happy scenes are harder. Your post demonstrates how to do it quite nicely. Character Profiling -- Are You Missing the Spark?